How is this for a cool idea? Melanie over at Bean Sprouts shows us how she painted squares of blackboard paint on jam jars to make reusable labels. I’m not sure how the paint holds up to washing etc, but it sure looks great! It occurred to me that this technique would be a nifty and whimsical way to label large glass jars for drygoods, or any other item where you need to relabel frequently. Although blackboard paint can be fairly pricey, Melanie pointed out that a request on Freecycle may turn some up for free (and free is my favorite price)-after all, lots of folks may have bought the stuff for a project and have some left over. 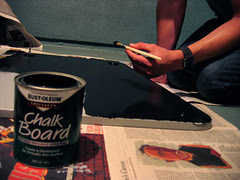 I even found a recipe (which I can’t vouch for as I haven’t tried it) for making your own chalkboard paint! Then again, you could buy some and make all of your Christmas presents, doing things like making a chalkboard plate (scroll down to see), a chalkboard table cloth, a chalkboard globe or even chalkboard vases! If you re-purpose items around your house, or buy inexpensive ones at the thrift store to paint, you could wind up with great one of a kind gifts for a pretty low price. Those are all such great ideas! Thanks for the wonderful tips and links! Oh I missed that at Bean Sprouts. That is a great idea. I like the others you mention too. Thanks! As always, more great ideas than time. I really would like to find a way to use chalkboard paint at the new place. . . . Excellent idea! We are using old mason jars filled with beans and rice and such to decorate for a bridal shower, and of course to help fill the new bride and grooms pantry. What a great way to label the jars. It will look much better than the white labels I was considering. Martha Stewart just had a big write up on chalkboard paint in her August or September issue of Living. My fav idea was painting the front of the fridge.